The keyless entry system connects to your iPhone through Bluetooth—the low energy kind—-allowing you to control who gets to come or go, straight from your phone or desktop. Best of all, you don't even need to replace the entire lock to make it smarter. Though he wouldn't say it out loud, co-founder Jason Johnson, told me that a few partnerships are in the works for Smart Lock and that it just might end up being picked up by a popular social network centered around subletting. Scheduled for launch later this year, Smart Lock replaces the inside of your door's lock, requires no wiring and works with virtually any deadbolt (90 percent compatibility, says August) on the market today. And unlike Kwikset's Kevo system, for instance, the system is completely hands-free. 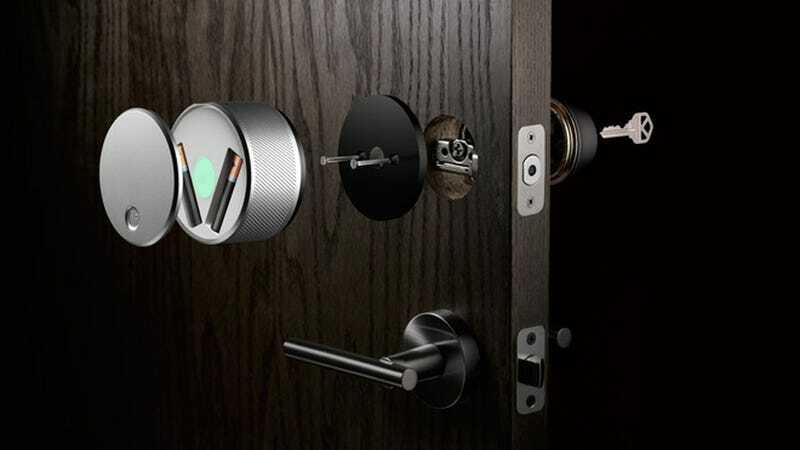 When Smart Lock senses that your connected phone has entered a set parameter, the door unlocks like magic. The system also runs completely independent of your home's power source and runs off of four AA batteries. And when those batteries eventually die—six months to a year—you can still use your physical key to get in. August gives you plenty of prompts through the app before that even happens. So shame on you if you ignore those motherly warnings. Even cooler, is the ability to invite and issue (via text or email) virtual keys to anyone within seconds right from your phone. This also allows you to control when said keys work and when to put the kibosh on them altogether. So, for instance, you'd probably issue your family members or BFFs with a key that works all the time. But you might only grant your cleaning service access a few hours a week. Smart Lock also keeps a log of every entry and exit for every issued digital key, which you can access anytime from either your phone or computer. It even sends a push notification in case you're that overbearing about who is in your house and which Smart Locked door they entered through. The app and your smartphone, not the lock itself, are what speak to August's cloud to send notifications. The obvious concern is that if you lose your phone, someone will have instant access to your house but you can remotely wipe any device with a working key. The app doesn't explicitly say where your house is either. As for Bluetooth security, like Lockitron, Smart Lock uses the same security protocols that are used for online banking. And unlike Nest, for instance, August has an open API and is apart of the Internet of Things Consortium, which is dedicating to getting all these IoT devices to talk to each other as more and more of them enter the market.